I apologize for the random posting times and photos being different. Time is really getting away from me! :/ My son has been staying up way too late, my husband's work schedule has been all over the place and the time change has really just thrown me off. On top of that I've been looking to improve my pictures with different light settings and backgrounds. For this post I tried out something new, a black background. I would love really love to have everyone's opinions on it! I've asked multiple people and everyone gives me different answers, I can't really make up my mind! :P Anyways, I have some lovely polishes from LynBDesigns to share with you today. Wether I decide to stick with a white or black ground, I will still be using a white background to photograph bottles. It looks way better than black! ;) Good idea/bad idea? 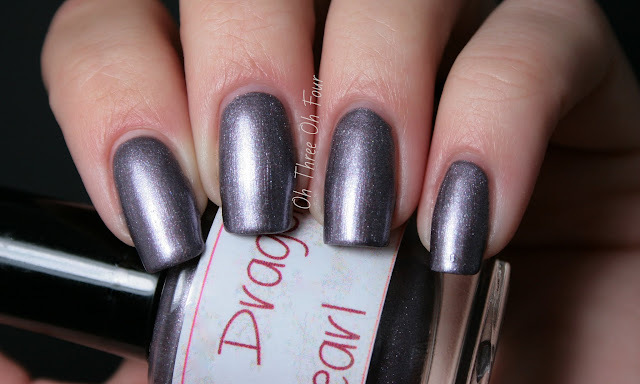 LynBDesigns Black Dragon Pearl Tea is a shimmery gray/purple polish. The color of Black Dragon Pearl Tea is based off the tea with the same name, in fact LynBDesigns has a whole tea collection! All nails are 2 coats with no top coat. Formula was perfect; it dried quickly and looks great with no top coat! I know everyone loves to see indie makers come out with more than just glitter polishes and this is one of them! The color is beautiful and in different lights it can appear a gray with purple undertone or purple with gray undertone. Bottle shots, close ups or both? Time and Relative Dimension in Space has a deep blue jelly base with blue, navy, and silver glitters. This color is described as a "Tardis Blue" for any Doctor Who fans out there. ;) I used 3 coats of Time and Relative Dimension in Space with a top coat of Seche Vite. Formula was again great! It dried super quick and it is evenly packed with glitter. I used 3 coats, though I could have gotten away with 2 but my first coat was a little splotchy, I assume because I am so light handed. This color is a lot of fun, even if you are like myself and have never seen Doctor Who! Also, since the mix of the glitters is spot on, the end result is perfect! LynBDesigns can be found on etsy here. She stocks not only polish but, an array of other neat products like perfumes, notecards and jewelry! Also, until Friday, November 16th, all polishes are only $5, a steal if you ask me! Find LynBDesigns on Facebook here.